It's me again, with another update. The kitchen cabinets still haven't arrived. The last we heard the paint booth broke down and needed repair, which backlogged everything. And that's all I've got to say about that. Dennis and I have been moving forward despite this set back, and I'll share what we've accomplished since my last report. Ryan the Electrician arrives in the afternoon. 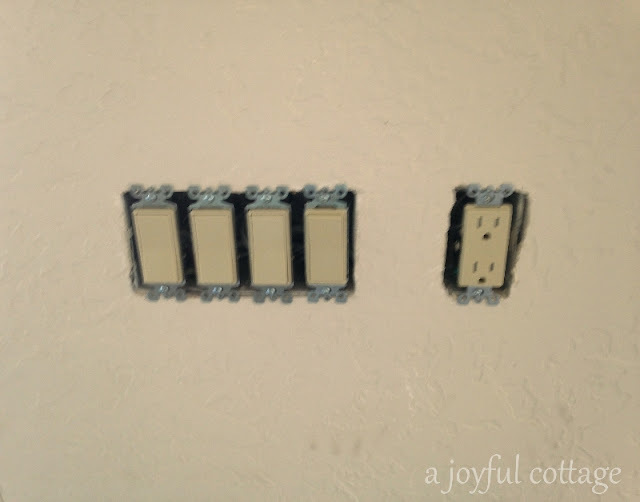 He installs light switches and power outlets. I chose rockers instead of toggles for the switches. 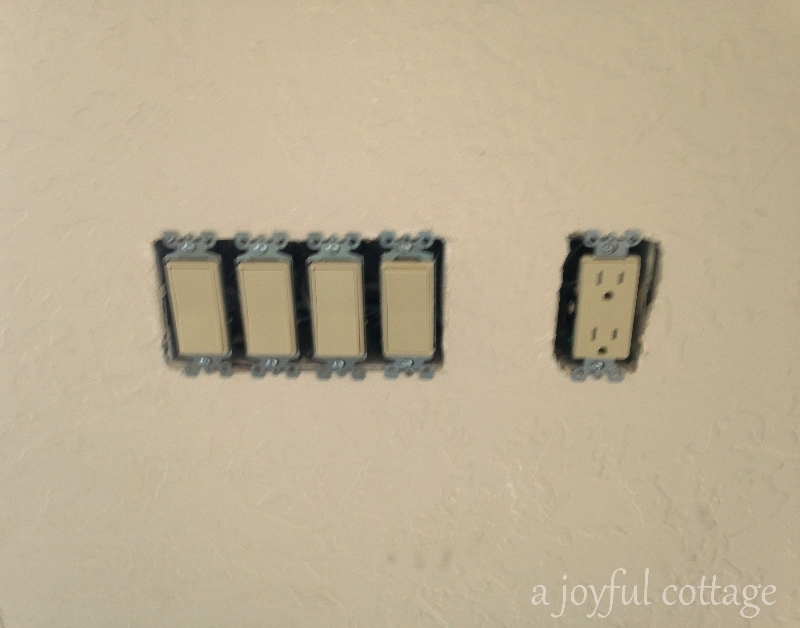 We used these in our last home and I found them to be very easy to keep clean, and I like the uncluttered look. Some people think they should only be used with contemporary decor. It's a matter of personal preference. I hear push button switches are gaining popularity. They could be fun for a more vintage look, but they're pretty pricey. About four times the cost of toggles or rockers. For me it's not worth the expense. 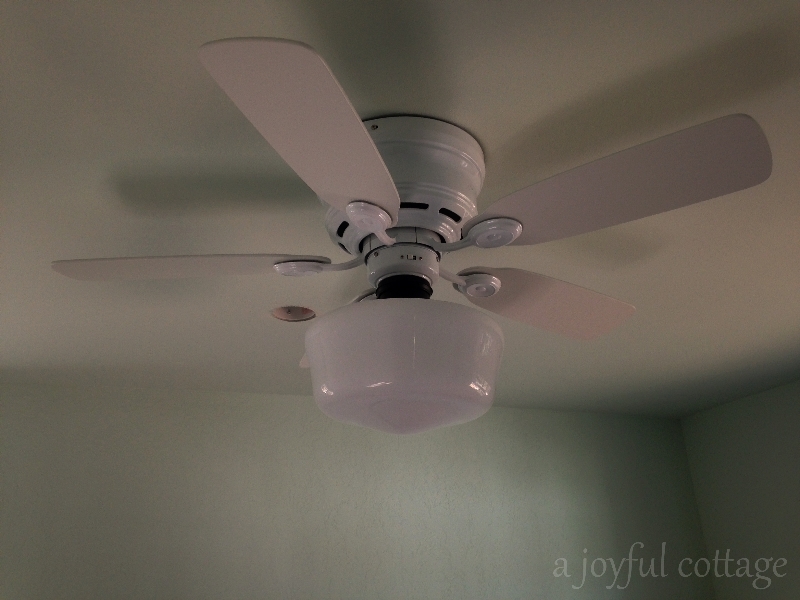 Ryan also installed the ceiling fan in our bedroom. 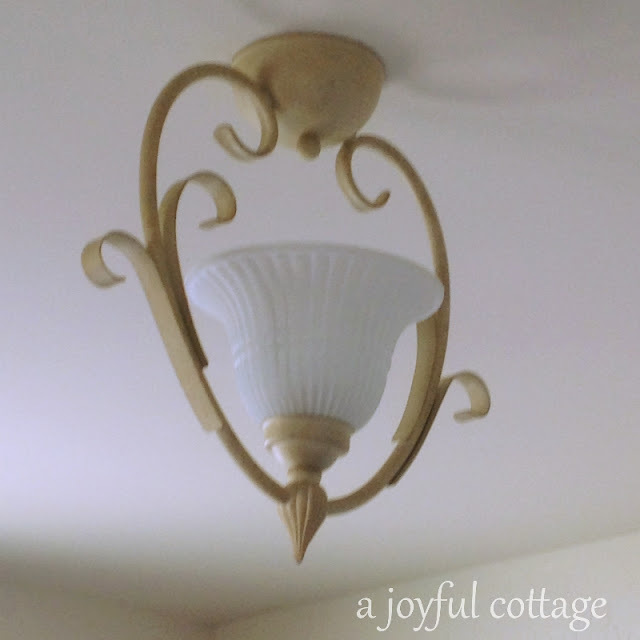 A ceiling fan in our cottage is a must for air circulation, both in the summer and the winter. We chose not to install air conditioning. Temperatures here dip to 40 - 50 degrees at night and warm to 75 - 84 degrees during the day in the summer. If we keep the windows open at night, in the morning the house is quite cool. 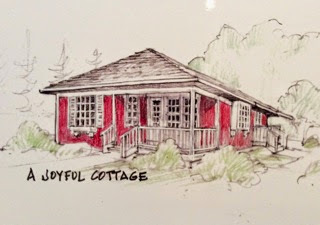 Our cottage is well insulated, so if we close the windows and doors before the morning air warms, the house stays comfortable throughout the day. 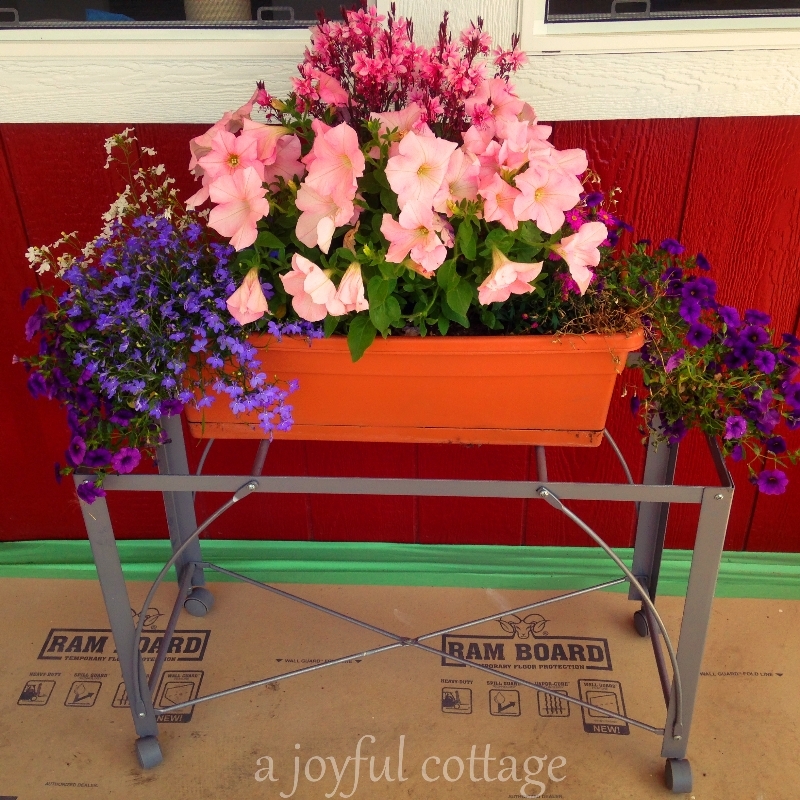 I purchased several containers of flowers for instant color. The metal stand was a $1 flea market find. When we have time Dennis will make a top for it and I'll give the whole thing a paint job. Ryan the Electrician installs the light fixtures. Dining pendant (raised and secured out of the way while construction continues). "All right, Mr. De Mille, I'm ready for my close up." 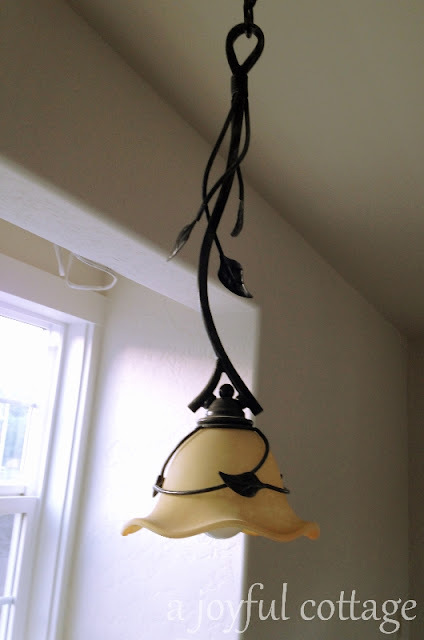 Ceiling light in my workroom. 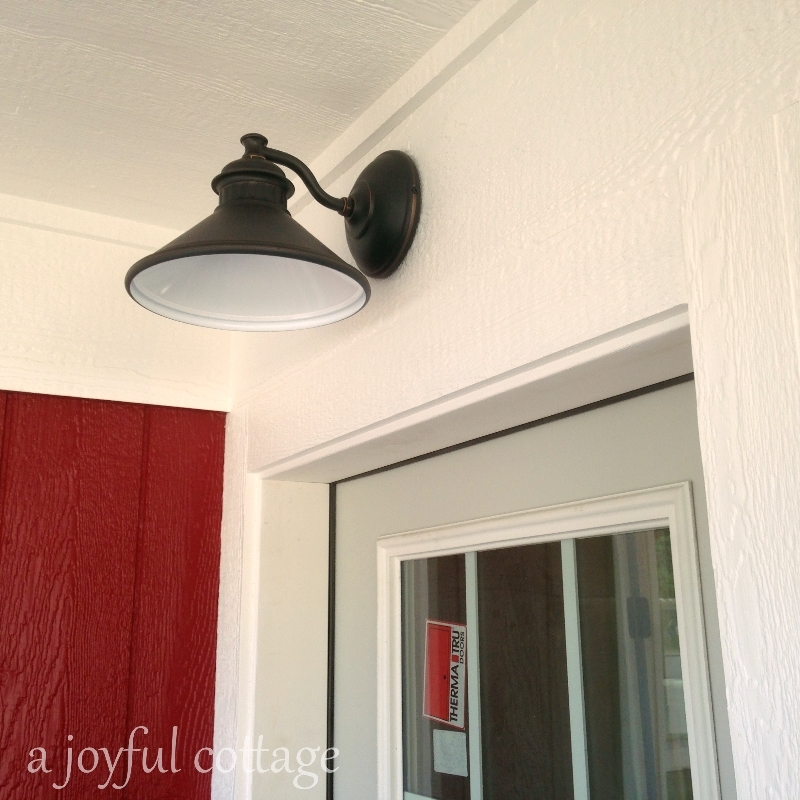 Exterior lamp over each entry door. 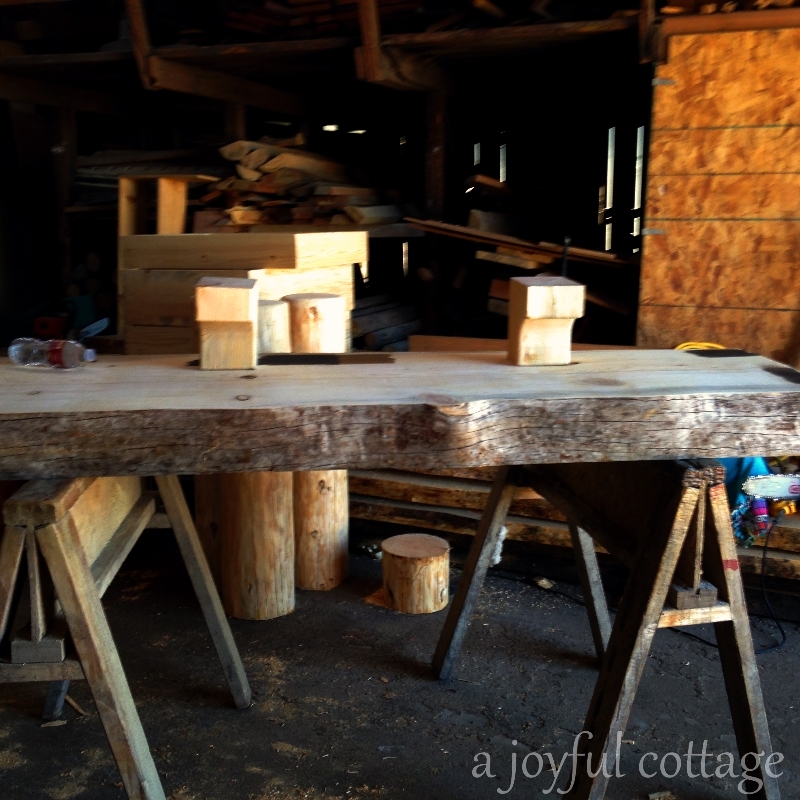 Chuck, Bronson's furniture maker, is making the mantel for our fireplace. We stop by his shop to see how it's coming along. 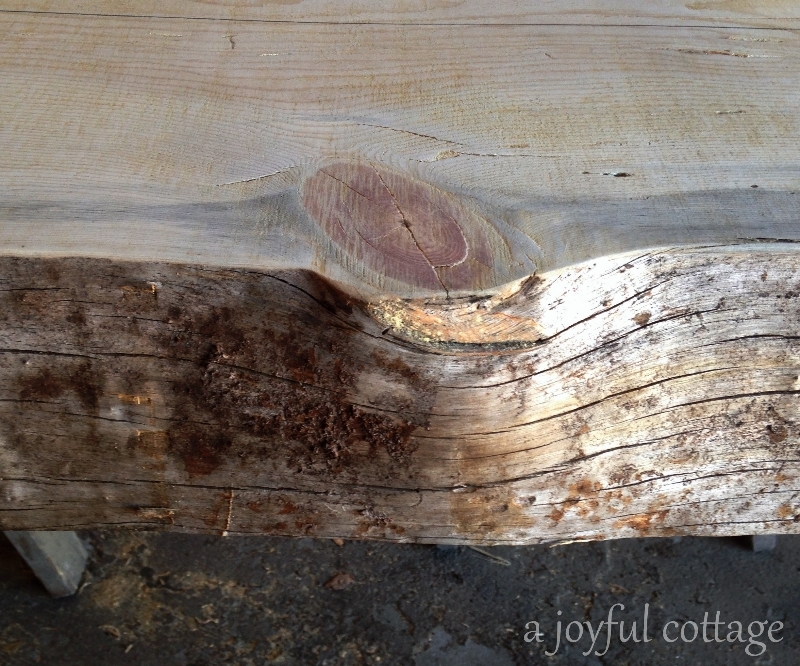 This is the pine log slab that will become our mantel. I love the big knot and cracks on the front. Chuck will sand this down a little and stain it a dark walnut. This is my mantel inspiration photo. 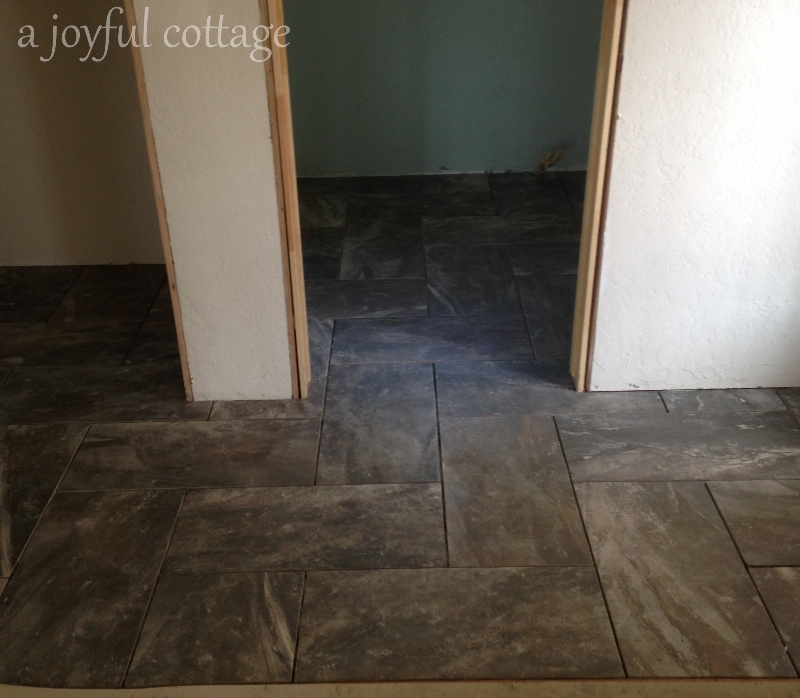 Dennis begins tiling the hallway and bath floors. 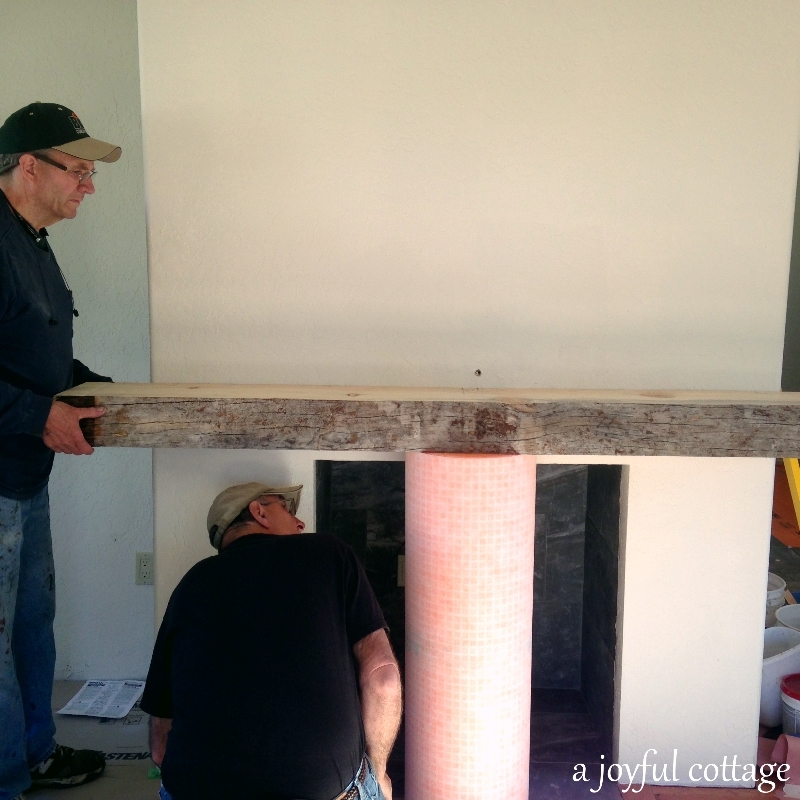 Chuck and Dean bring the mantel to the cottage for measurements before cutting. Here it is upside down with the corbels. Ryan is supposed to come back and change the outlet cover to a gray one. 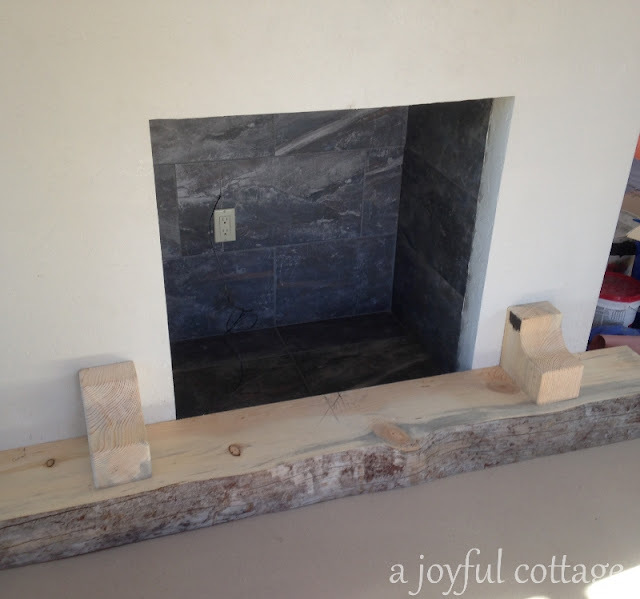 I'm not sure it will matter once the heating stove is installed. I doubt the outlet will show. Dennis and I take a drive after attending our church worship service. There's nothing like new-mown hay to soothe the senses. 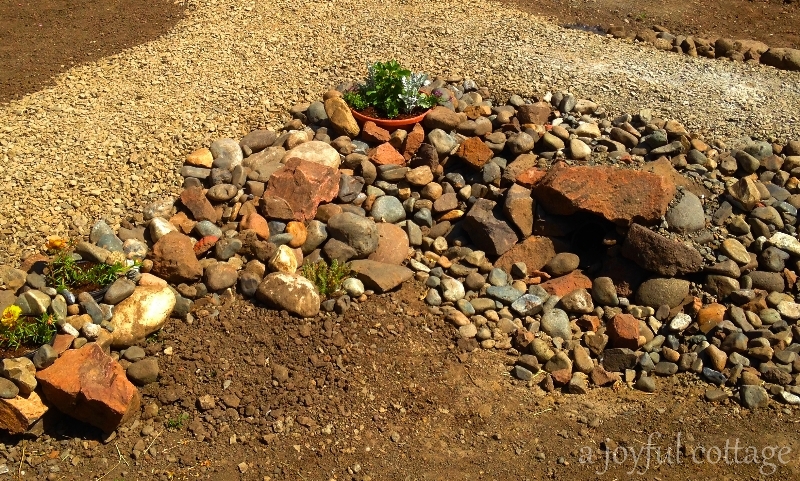 While Dennis works on the tile I spend time on the dry creek bed, adding rocks and potted plants. This project will take time to complete, and isn't a high priority right now. Dennis lays a lot of tile. My main task is to drive to the flooring store for more mortar. An hour round trip. 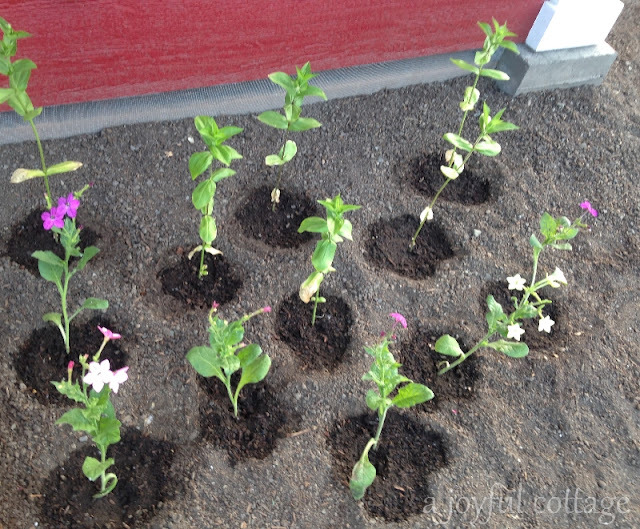 I plant Zinnias and Nicotiana. 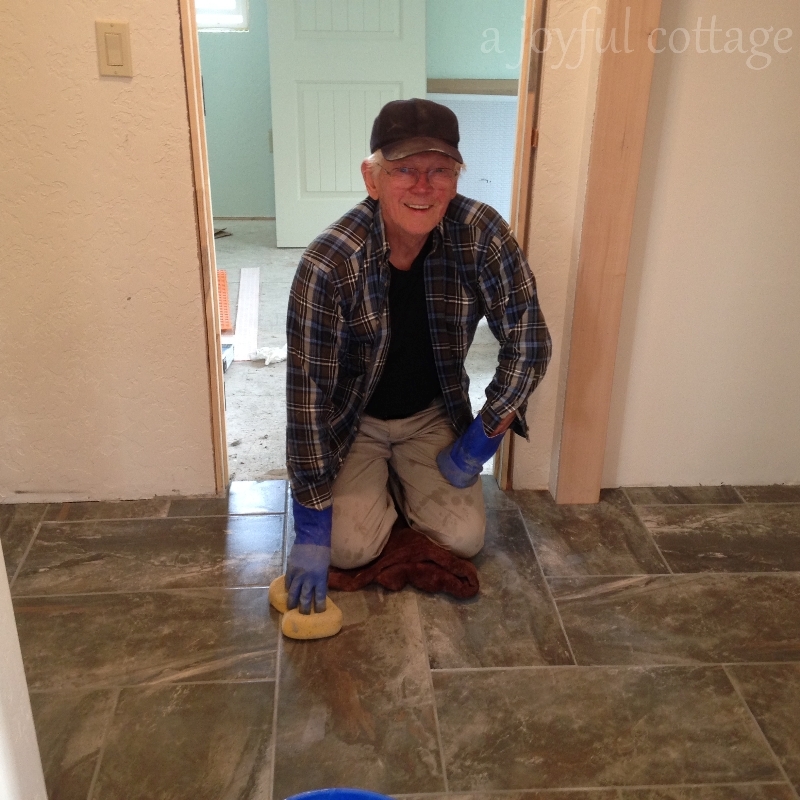 Dennis finishes grouting and cleans the tile. Dennis crafts and installs the bathroom trim. I apply primer to the door trim. 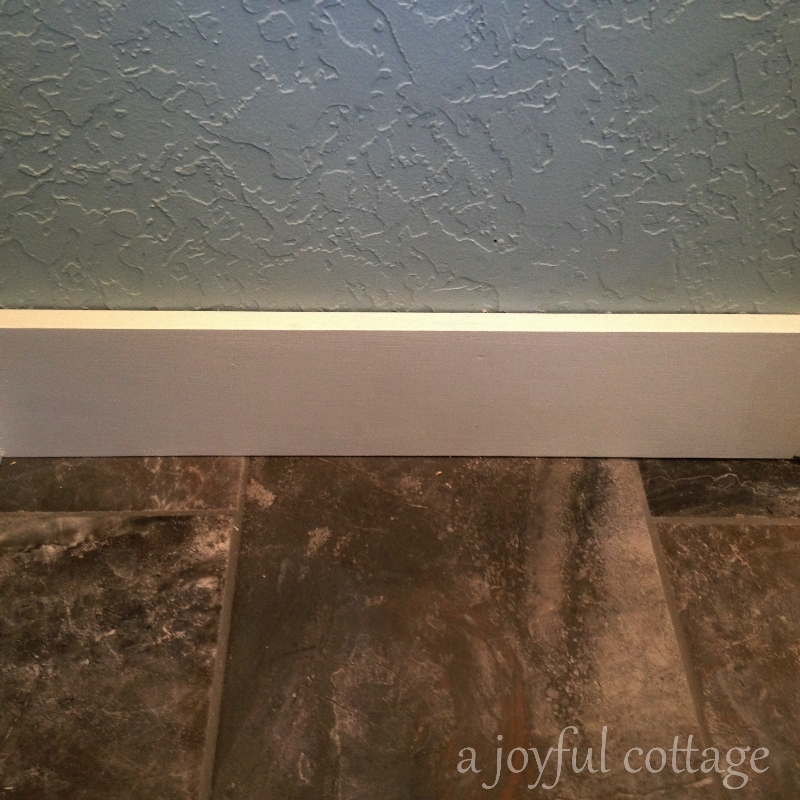 And apply primer and two coats of Do-It-Best Star Magnolia to the baseboard. Star Magnolia will be used on all the interior trim. Dennis begins trimming the garden window. 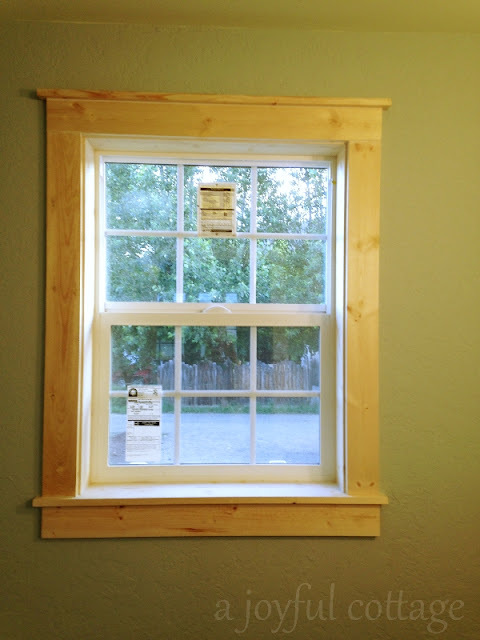 Dennis finishes the garden window trim. Ready for me to paint. 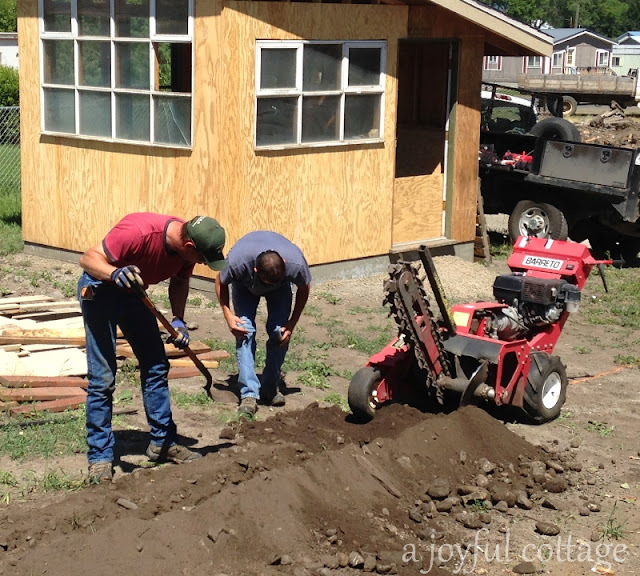 Dennis enjoys building the trim and casings and even on Father's Day he wants to continue working, which he says isn't work at all for him. The LP gas company digs the trench and installs the gas line. 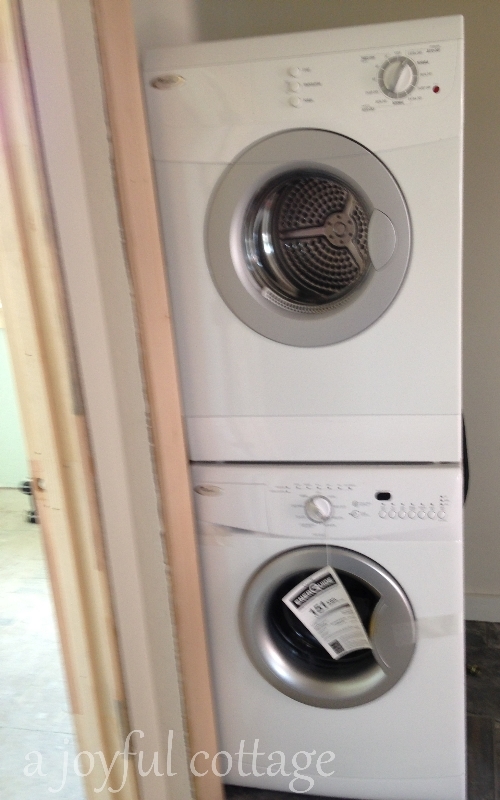 Our compact front load stackable washer and dryer are delivered. These are made by Whirlpool and actually are smaller in total dimensions than the all-in-one apartment size laundry centers. I'll give you my opinion on their performance once I start using them. Dennis trims the bedroom windows. 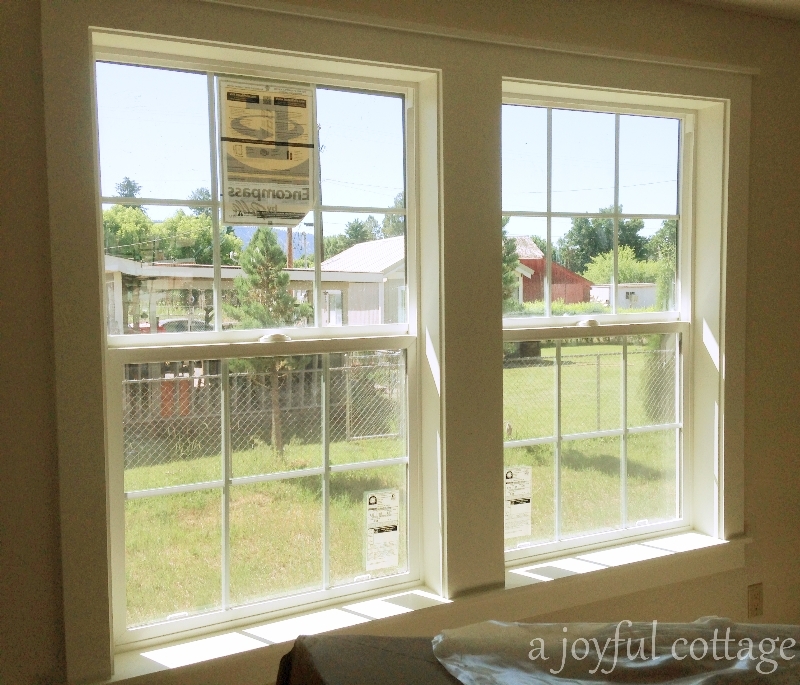 I finish painting the garden window. Chuck wants me to come to the shop and approve the finish on the mantel. I do. It looks great. I'd show it to you now, but I want you to see it after it's installed. We have to have some surprises, don't we? It's like not showing anyone your prom dress before the big night. I take a day off to shop and have lunch with a friend. Life feels kind of normal today. 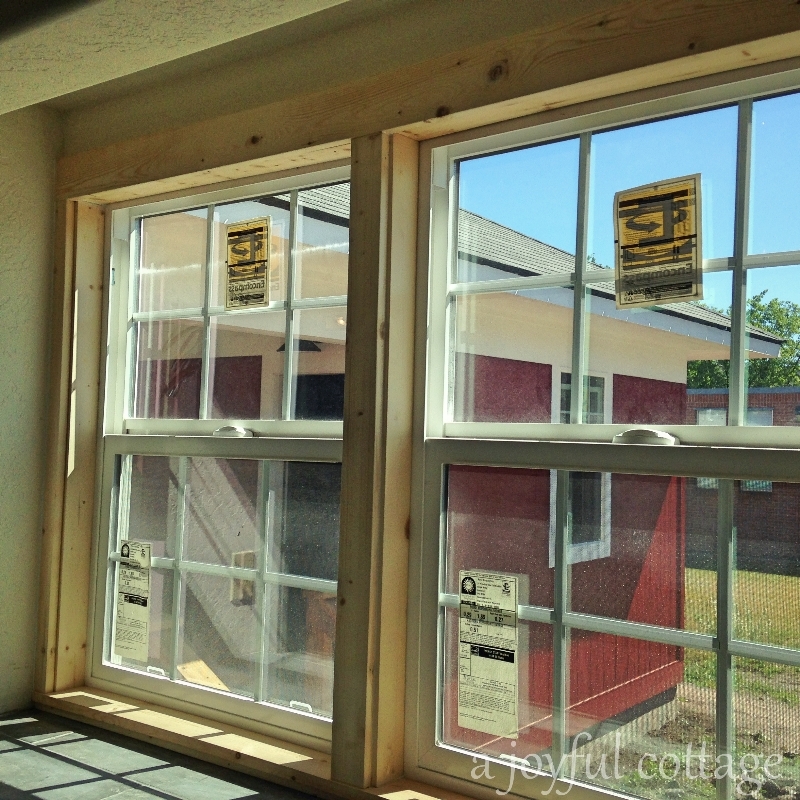 Dennis works on the studio window trim. While Dennis works on the trim for my workroom, I apply one coat of Star Magnolia on the living room window trim. Dennis leaves for a doctor's appointment after lunch and I head out after finishing the window. 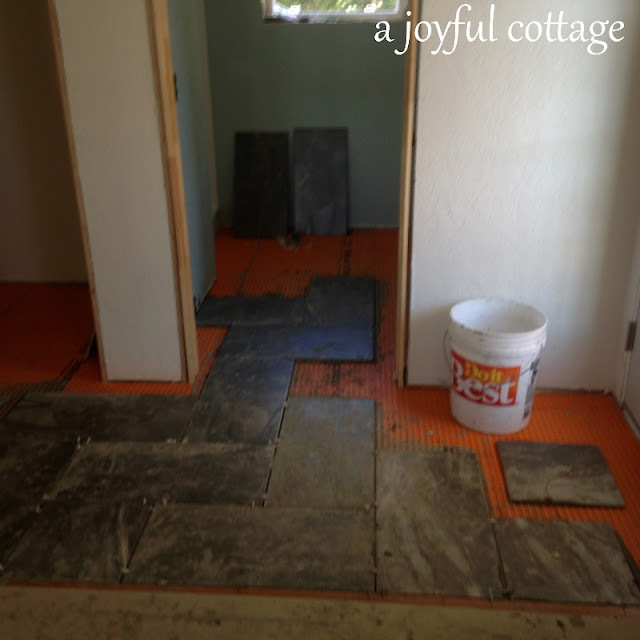 I'm very blessed to have a husband who's able to do finish carpentry, lay beautiful tile and do all the other things he does to make me happy. Thanks, Honey. We're waiting for the plumber to come for the finish work. 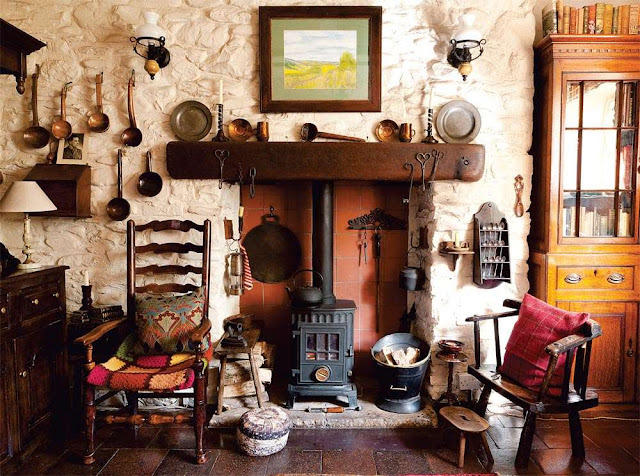 Once we have a toilet and shower, even without the kitchen we can camp out in the cottage. Dennis had minor surgery yesterday and will be taking it easy the next two days (I hope). 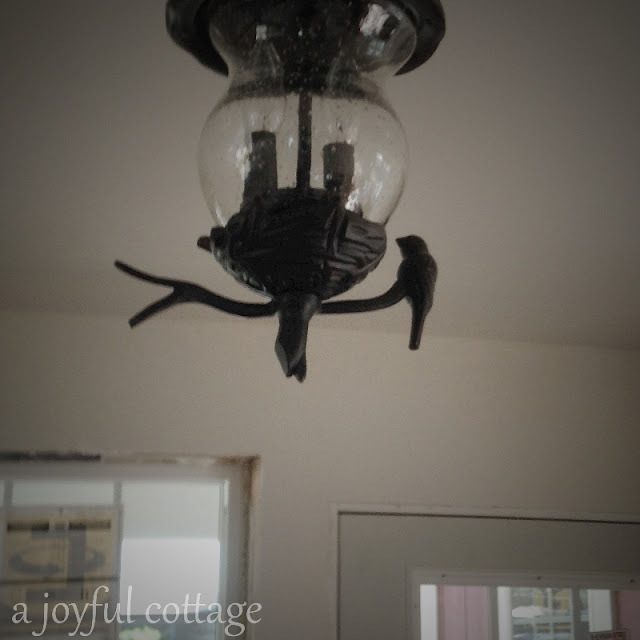 After I post this and finish my coffee I'll head for the cottage for more trim painting. I find it rather relaxing. I hope you're day is off to a great start. Wow! Looks terrific! 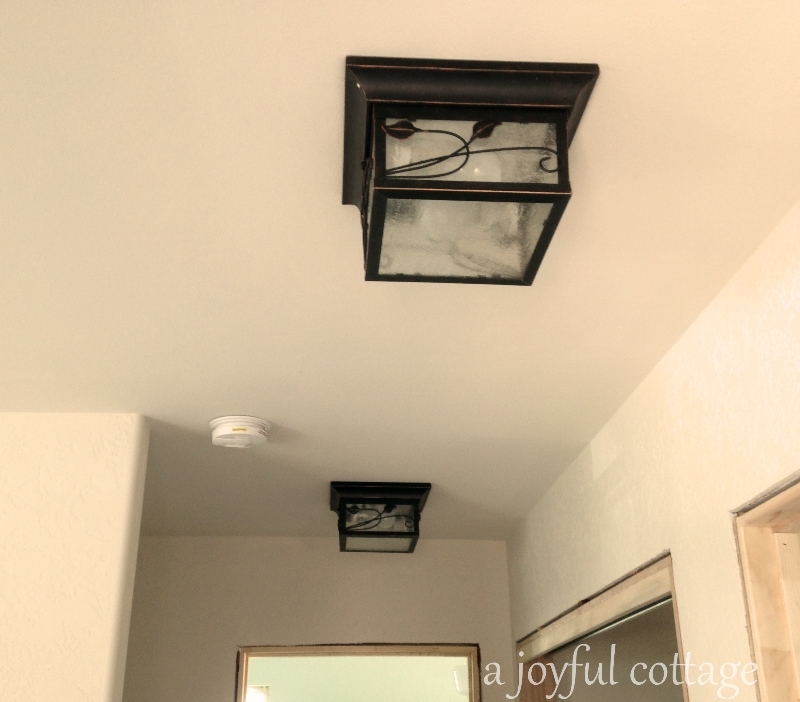 Love your beautiful flowers and Love the light fixtures! Great job! Hi...sorry to heard the cabinets are going to be awhile..but..you sure got a lot done..nice job too..i especially LOVE that fixture in the dining area..was that a store buy or catalog order..i'd love one too..Dennis did a fantastic job with the tile..and i bet that river bed will be beautiful when finished..just a tip on the front load washer..my daughter had the whirlpool..it had a problem with getting moldy around the rubber seal..didn't know if you had heard that before..looking forward to progress report #12...hope you 2 have a nice weekend.! It's marketed as an outdoor light, but I'm using it inside. 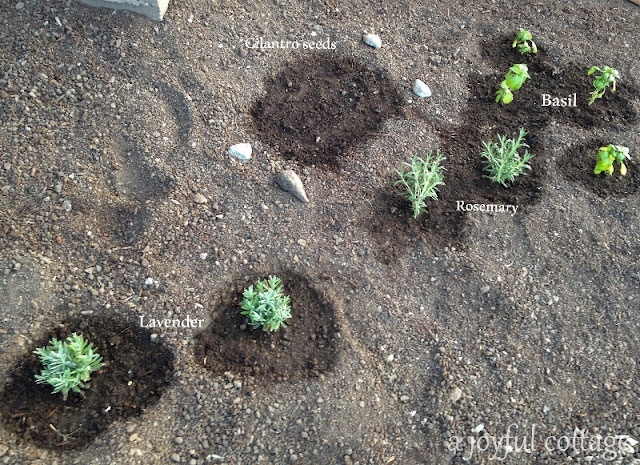 :) Thanks for the nice comments, Wende. I LOVE the way it's all coming together! 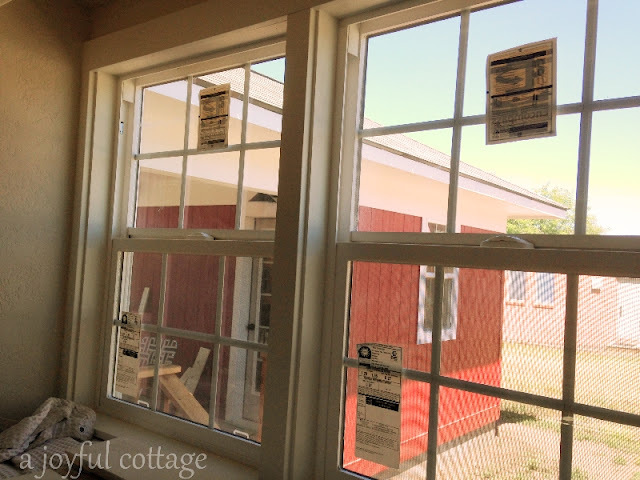 It won't be long now and you will be settled in and cozy after working so hard to make your dream come true. Sending get well wishes to Dennis and stay well wishes to you. I can't wait to see what you do next. 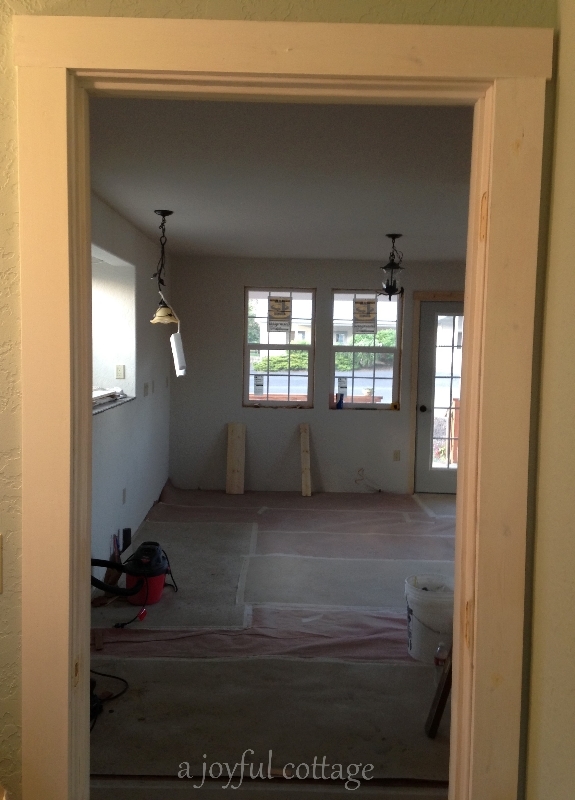 Hope the kitchen cabinets arrive soon. Thank you for taking time to keep us posted. 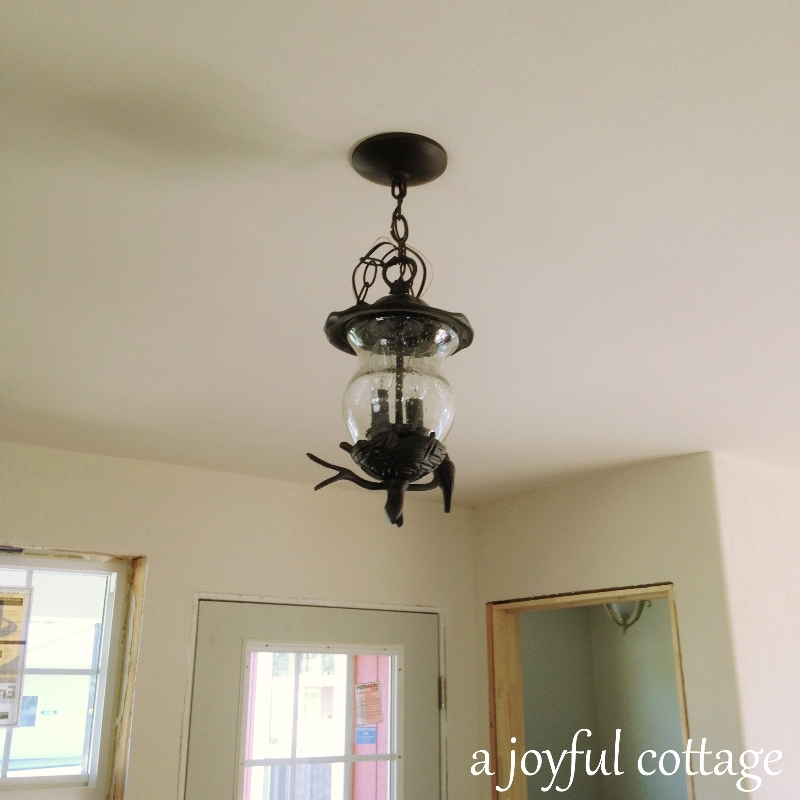 I love seeing how your cottage is coming along. It looks beautiful. Hoping your Hubby heals fast from his surgery. What a labor of love, Nancy! 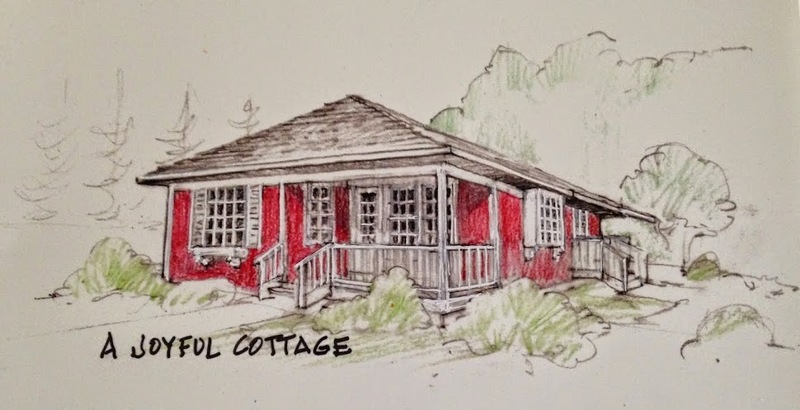 Your cottage is looking fantastic, and you've made so much progress! Adding the window trim really makes the whole cottage look more finished. I love the tile you chose! Wow! You really are making a lot of progress! 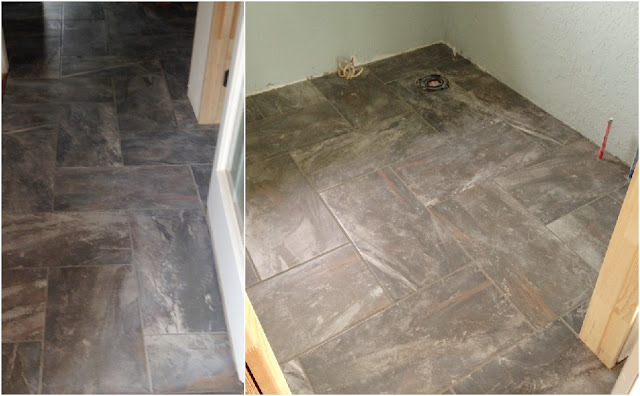 How wonderful that Dennis can install the tile floor himself! I don't know if you've read my blog lately, but we purchased a small trailer, that we are now in the middle of remodeling, and I would love your thoughts/suggestions if you have time. It is a huge work in progress, but we are quite excited about it! 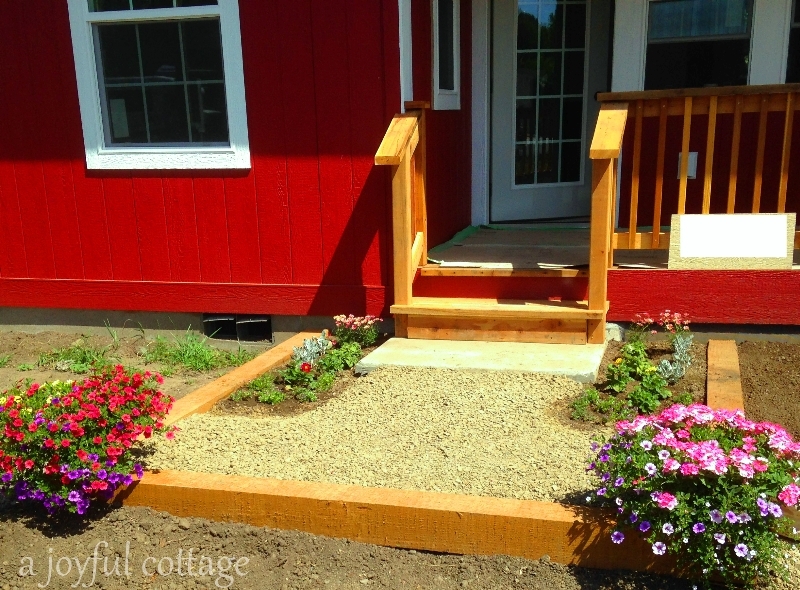 I just loved all the landscaping you have done as well... it is going to be such a joy once you get moved into your happy space!!! Is it hot there? 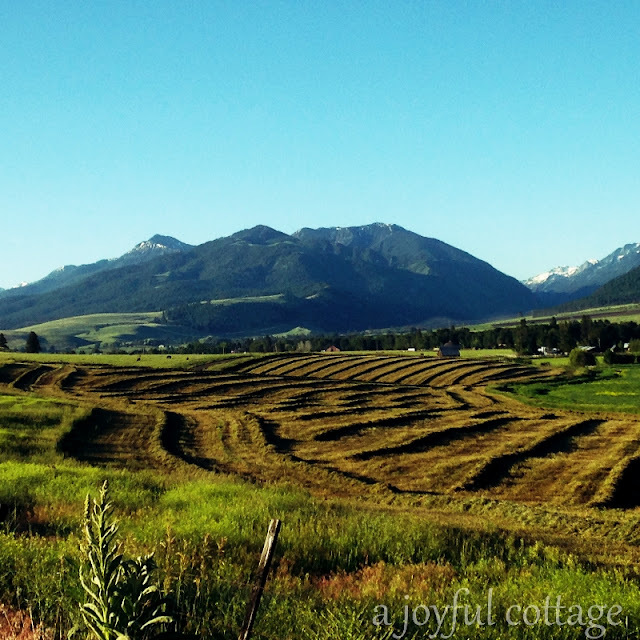 It has been unbearably hot here, and now we have a terrible threat of wildfires here. 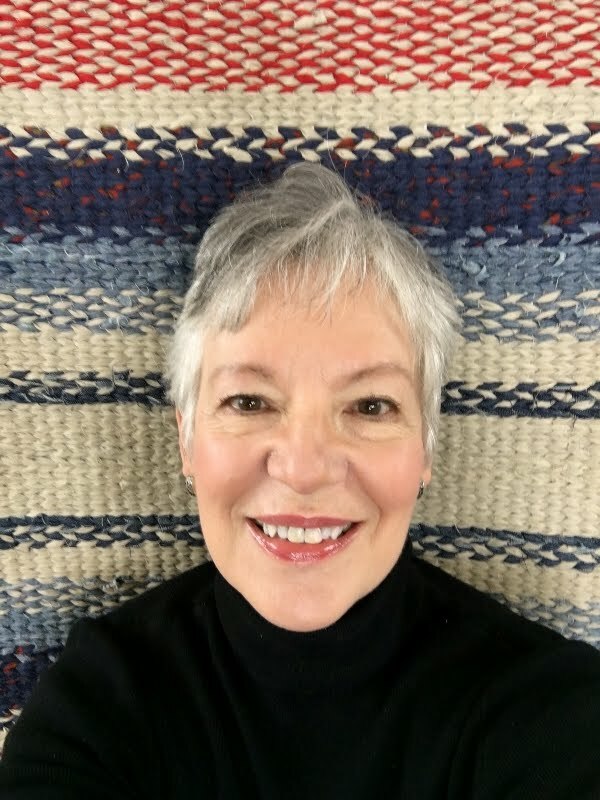 Enjoyed your update as always, it is inspiring! Hugs to you my friend! Wow...things are really getting there.The flowers you planted already look so beautiful >3. The light fixtures are so my taste.But I must admit that I can´t wait to see the finished mantle...I believe this will be my personal highlight.I hope you gonna get your kitchen cabinets real soon.